Eduardo Castillo interned at StartingBlock in Summer of 2019 as part of the CEOs of Tomorrow program. Recently, Eduardo came back and spent a few days of his spring break volunteering at StartingBlock. He sat down with Executive Director, Chandra Miller Fienen, to talk about why he chose to intern for StartingBlock, what draws him to entrepreneurship, and how he hopes to use his StartingBlock experience in the future. Chandra: Eduardo, tell me a little about yourself. Eduardo: I am a Senior at Madison La Follette. My plans after high school are going to University of Wisconsin-Milwaukee. I am a well-rounded student eager to learn and network. Chandra: So, StartingBlock hired you as a part of the CEOs of Tomorrow internship program. Can you tell me more about the CEOs of Tomorrow program and your experience with them? 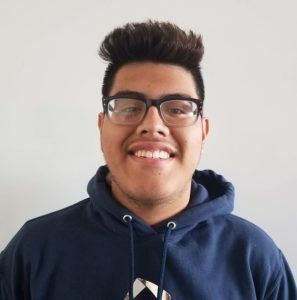 Eduardo: CEO’S of Tomorrow was created to help students in middle and high school connect with people in the community and learn about social entrepreneurship. By doing so, we were encouraged to start our own business and compete in a pitch competition. Within the program you get a chance to work in a team or as an individual to solve problems within our community. Chandra: So you had a chance to intern at several places, what made you choose an internship with StartingBlock Madison? Eduardo: As a student, I am always looking for opportunities to get involved with mycommunity. My passion for business made me want to learn more about it, due to my passion i started to think about starting my own business and StartingBlock was the place for me to learn more about startups. Due to all the different companies I could talk to in order to get some insight to a world of possibilities. Chandra: Okay, your first day at StartingBlock was just weeks after we opened? What was your first impression of StartingBlock? Eduardo: My first impression was “this place will be the future”. The whole environment was everything I hoped for and everyone was so welcoming. Chandra: What did you do at StartingBlock as a summer intern? Eduardo: StartingBlock Madison was kind enough to bring me onto their Culture and Communication team. As an intern, I got to see what an entrepreneurial hub looked like behind the scenes and all the hard work that startups do. Over the course of my period here, I got a chance to network with startups and learn more about the entrepreneurial spirit. I got a chance to learn in a fast-paced environment how entrepreneurship works and helps others and most importantly I learned the value of team building. Chandra: What was the best thing that you did over the summer internship? Eduardo: I got connected with a company called Live undiscovered music. LÜM. I got to learn and become friends with all the team members. Eduardo: This placement made me realize that someday I want to put in the same effort as all of these different companies to create a business that helps out the community. Chandra: We were thrilled to have you back at StartingBlock when you approached me to volunteer during your spring break. I think it shows what an exceptional person you are that you wanted to spend spring break here with the StartingBlock community. Tell me how you think StartingBlock has changed since the summer to today. Eduardo: It has more companies hosted here. More art work and overall systems are improving everyday. StartingBlock changes everyday, and I can’t wait to see all the new things when I visit next. Chandra: Although we only had you for a few days, you accomplished something that I believe is really important to community building which was to help create our StartingBlock community directory. Can you tell me a little bit about what you did and why it is impactful? Eduardo: I came back to StartingBlock in order to get to know the space better and to network with the new companies. To facilitate this, we selected a project that created an opportunity for me to talk to everyone at StartingBlock. Specifically, to work on helping create the StartingBlock member directory. I got to take pictures of all the different team members from all the different companies and learned something new about them. Chandra: Eduardo, I want to thank you for all the hard work that you have done and I wish you the very best of luck at college next year. We look forward to having you come back and hearing about how things are going. Is there one or two things that you have learned at StartingBlock that you think will help you in the future? Eduardo: At the end of the day, I believe that this experience has given me a whole new set of skills to use in my future career. For example networking and making new friends. One piece of advice that I took away was, never to be afraid to ask for help because people are more than happy to teach you something. Chandra: Okay, final question. You asked everyone here this question as part of the directory, so you know what is coming. Eduardo, what is your superpower? Eduardo: If I had a superpower, it would be teleporting. I would pick this because it would help me get to places faster.